All of the Three Acre Kitchen products were born in Nancy Brown’s kitchen in Hopkinton, NH – doing what she loves doing most – feeding friends and family. She developed a balsamic vinaigrette recipe that everyone loved – even her thirteen-year-old daughter. She thought if her daughter liked it, she might really be onto something. So with the encouragement and help of her friends and family, she launched Nancy’s Specialty Foods, LLC with her first product, Nancy’s Balsamic Vinaigrette. Offering a taste of it to neighbors at her town’s newly established farmer’s market, Nancy found that when people tasted it, they were hooked. In 2004 she took her dressing to the Made in NH Expo where she established her first wholesale accounts and caught the interest of the NH Business Review. The following year her wonderful dressing won a New Hampshire Magazine, Best of NH Award. Since then, Nancy has been busy growing the business. As a result she now offers two new products, a Blueberry Balsamic Finishing Sauce and a Balsamic Cooking Sauce; both have won accolades. Her Blueberry Balsamic Finishing Sauce is a delightful and sophisticated dessert topping as well as a finishing glaze for meats and fish. Her Balsamic Cooking Sauce is infused with the flavors of tamari, juniper, rosemary, and garlic and is as a marinade and a cooking sauce for meats and vegetables. Of course challenges also have come with the growth of the business. One of the biggest challenges was facing the realization that “Nancy’s” was already a trademarked name. Looking for a meaningful name for her business was easy. 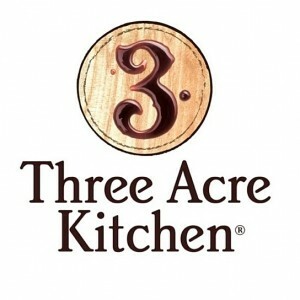 Her New Hampshire homestead is known as the Three Acre Wood – and her kitchen is the heart of her home – so the new trade name, Three Acre Kitchen, was born.